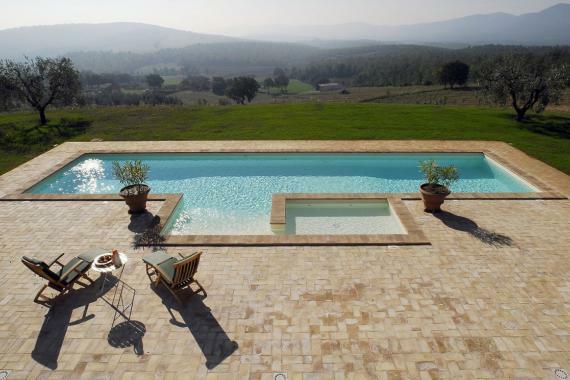 Villa Giovanni is for rent near Moore in Tuscany with panoramic views across the Tuscan countryside. It is only 35 km. to Orvieto with its beautiful cathedral. Lovely holiday villa for 8 with 4 bedrooms, 4 bathrooms, private pool with paddling pool and WiFi internet! Holiday villa Giovanni lies near Morre and Collelungo (1,7 km) with shops and only 15 km. from Todi with restaurants, shops and bars. It is a few minute drive to Lake Corbara with watersport facilities. Villa Giovanni comprises 3 floors. On the ground floor there is a spacious living room with fire place, a fully equipped modern kitchen and a dining room for 8 with fire place. Furthermore on this floor 2 double bedroom with en suite shower room. There are several covered terraces with comfortable outdoor furniture. On the first floor there is a double bedroom with en suite bathroom. In the basement you will find the fourth double bedroom with en suite bathroom. Villa Giovanni sits in a large well-tended garden with lovely swimming pool (14 x 6) with paddling pool. The pool is surrounded by a large terrace with sun beds and parasols. Splendid views across the beautiful Tuscan countryside. Holiday villa Giovanni is for rent near Morre in Tuscany (Italy). Morre and Collelungo with shops: 1,7 km. Todi: 15 Km. Orvieto: 35 km. Perugia: 50 km. Airport Florence: 90 min. Airport Rome: 90 min.